Hello, Kenarry readers! 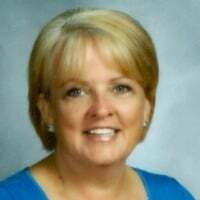 I’m Pam from The Birch Cottage. I’m back after my summer break to share how to make Pumpkin Candy Dishes from Terra Cotta Pots with you. I may have been on summer break, but you, dear friends, were on my mind! 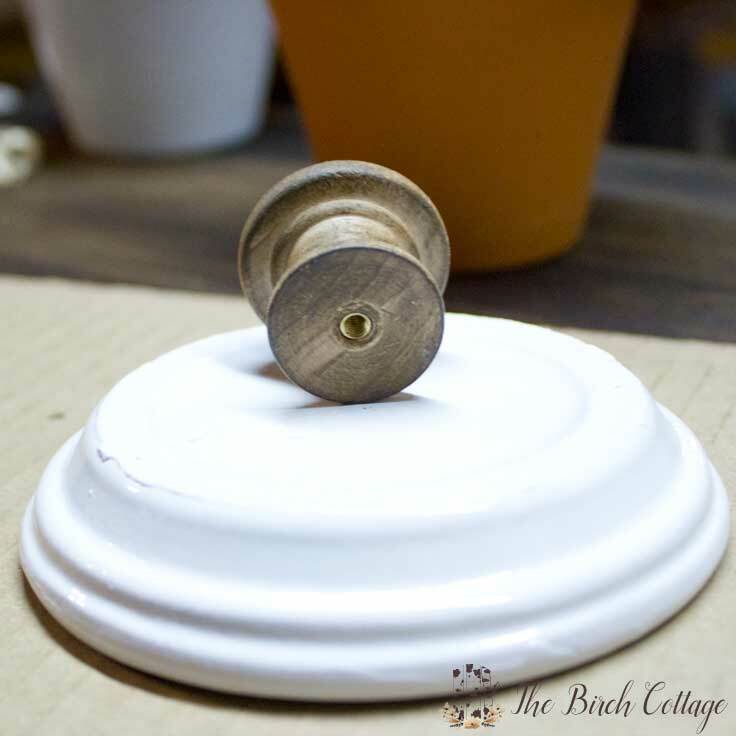 I knew when I took my summer break that you all would be here waiting come October and I’m just so glad to be back sharing this super easy DIY project with you. 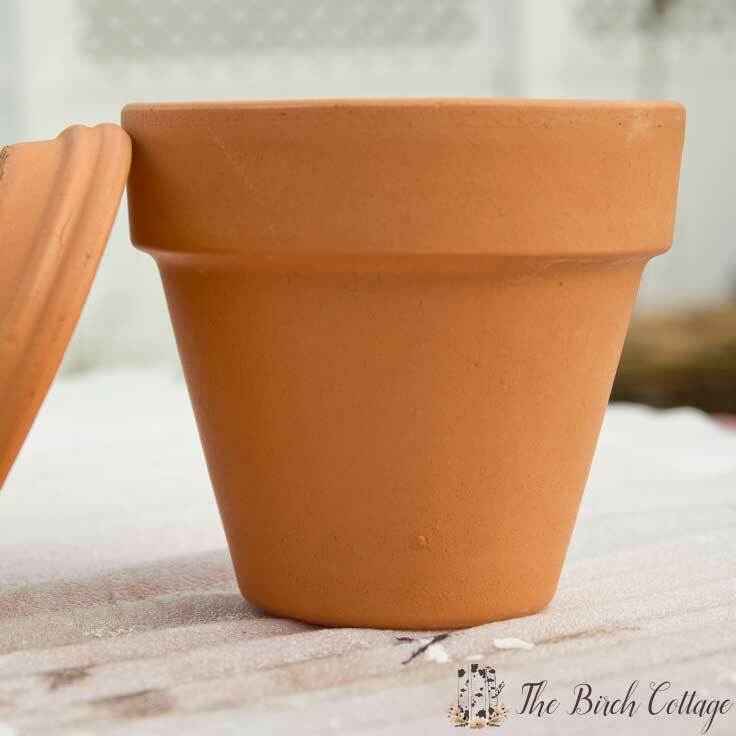 I had previously shared my How to Paint Terra Cotta Pots tutorial with you here. I loved this project! And, I’m happy to report my herbs that I planted in my painted pots are doing just fantastic. I planted some sweet basil and rosemary – two of my favorite herbs. I am especially fond of rosemary. 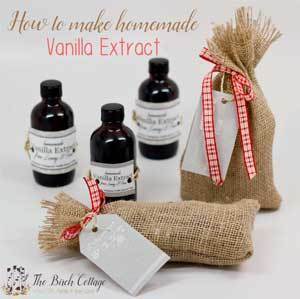 It’s just so aromatic and makes for a great rub on chicken, pork or even herbed butter. 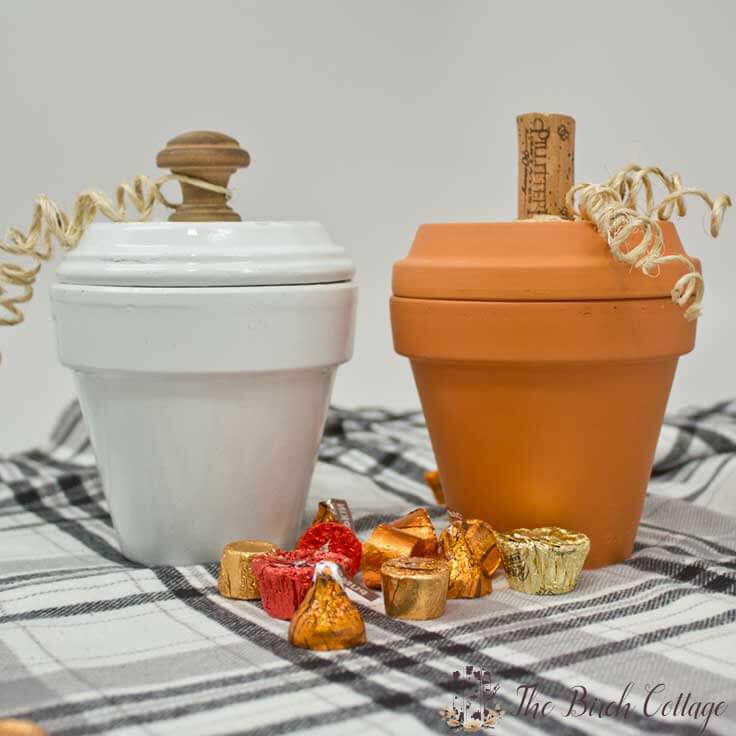 I loved the look of my white terra cotta pots so much, that I thought I’d incorporate a white pumpkin in my DIY Terra Cotta Pots Pumpkin Candy Dishes tutorial. When I showed this white pumpkin candy dish to my husband, he actually wasn’t very impressed. He said, “Where’s the pumpkin?” Really? Well, nonetheless, I thought it was adorable and that’s why I’m sharing it with you today! 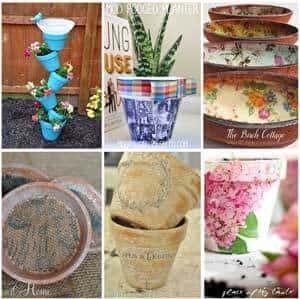 DIY projects simply do not get much easier than this! I selected a wine cork to use as the pumpkin stem for my orange pumpkin and a drawer pull for the pumpkin stem for the white pumpkin. You could really use any number of things for the stem – pieces of wood, dried grape vine, dried pumpkin vine, etc. For the drawer pull, I already had some dark walnut stain on hand from my picture frame projects, so I applied a small amount of stain onto the drawer pull and immediately wiped it off. For my pumpkin stem, I used a cork from a bottle of wine that I had been saving as the stem on my orange pumpkin candy dish. My cork had a little piece of plastic in the tip and I simply removed the plastic tip. To make the vine, I used some twine, Mod Podge, a small paint brush and a pencil. 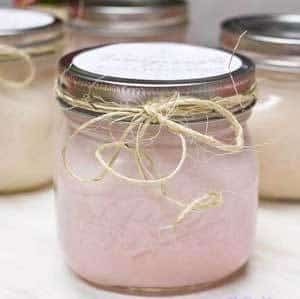 I took about a 12” piece of twine and using my small paint brush, brushed Mod Podge along the length of the twine. 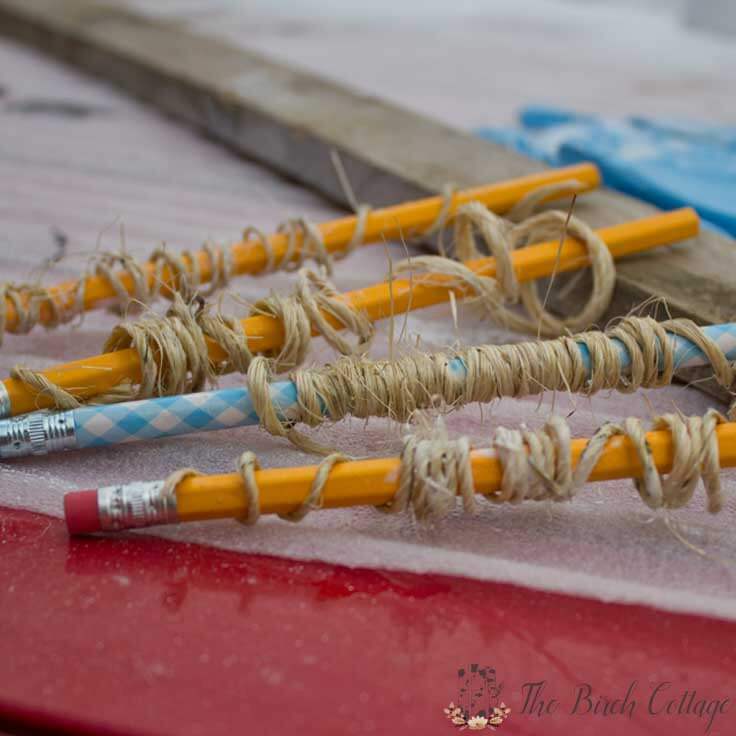 I then wrapped the twine around my #2 pencil and waited until the Mod Podge was almost dry. Then you can unwrap or gently slide the twine off the pencil. 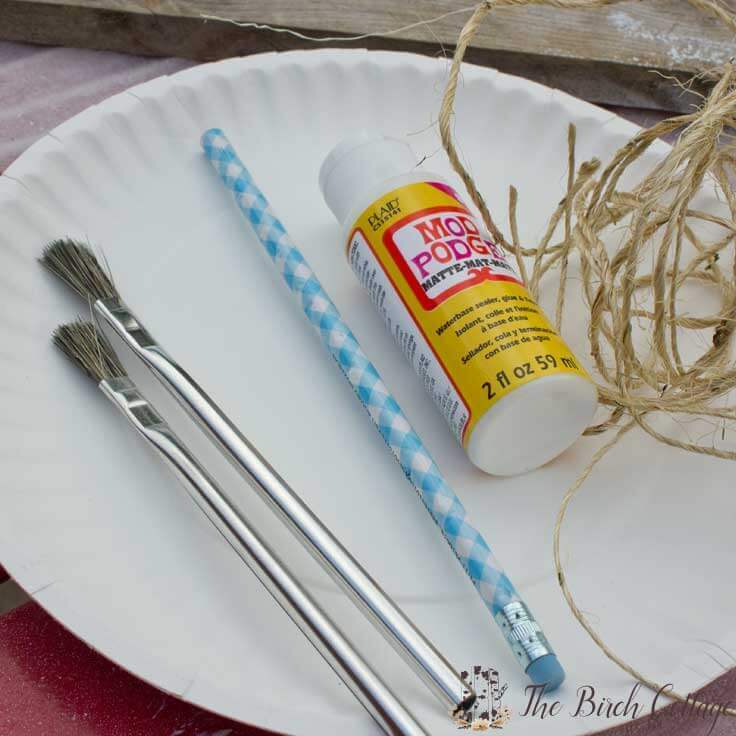 The twine will want to stick to the pencil because of the Mod Podge, but you can reshape it once you’ve removed it from the pencil. I then laid my vine/twine aside to finish drying completely. 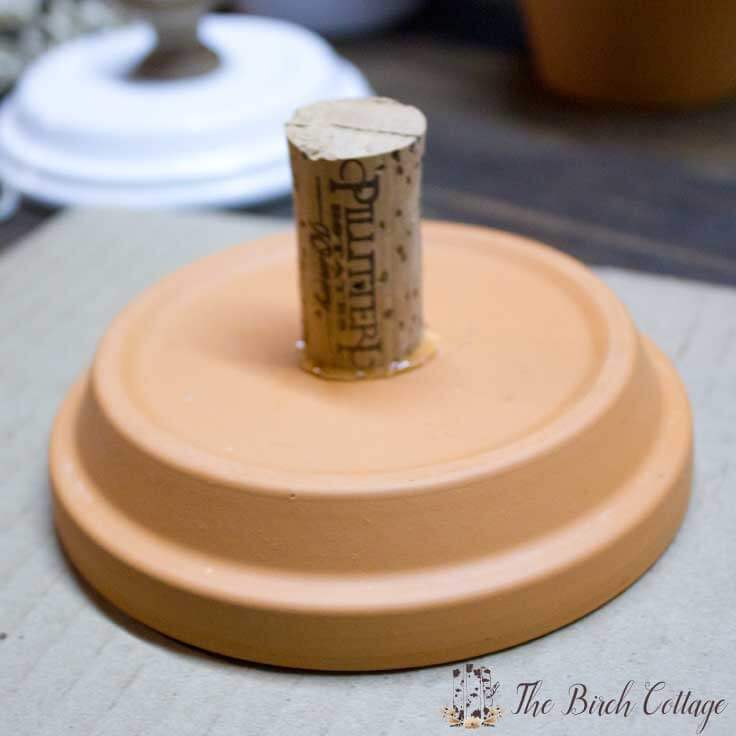 Once your stem and vine are dry, simply apply hot glue to the bottom of your drawer pull or cork and affix to the bottom center of the terra cotta pot tray. Once the stem was dry, I simply wrapped the twine around the base of the drawer pull. 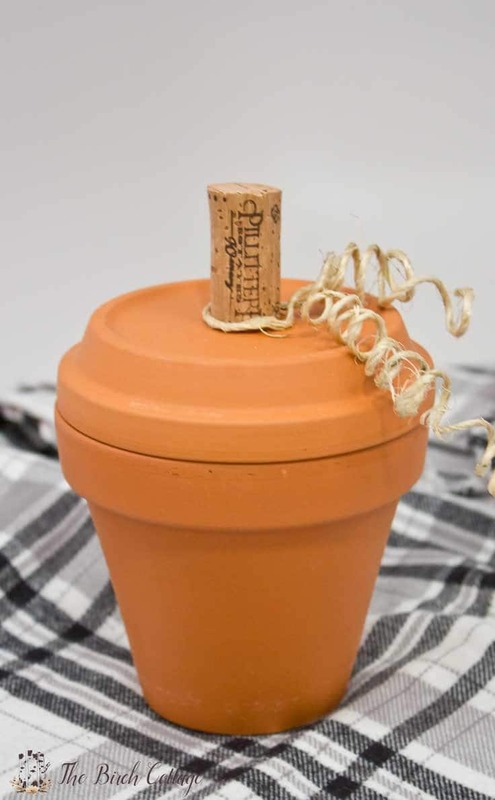 You could also hot glue the vine in place around the bottom of the drawer pull or cork. Now, was that super, duper easy or what?! 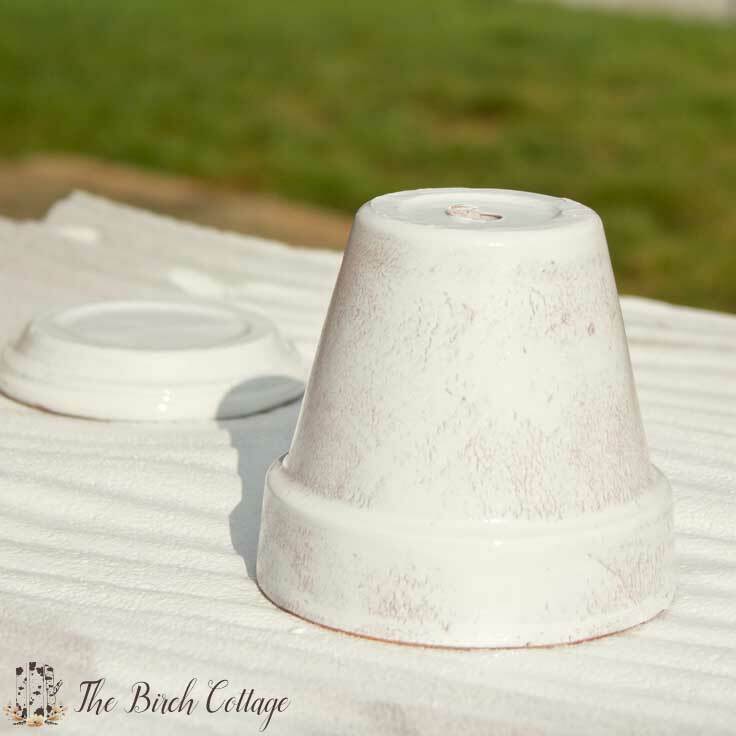 The supplies and instructions for the DIY Terra Cotta Pots White Pumpkin Candy Dishes are pretty much the same as the orange, except I spray painted the entire pot and tray white. Just in case, here are the instructions for the white candy dish. Just like with the orange pumpkin candy dish, you could really use about anything for the pumpkin stem. Just let your creativity flow. I even almost made burlap leaves for my pumpkin candy dishes, but decided I liked the simplicity of the stems and vines. For my pumpkin stem on my white pumpkin candy dish, I used a wooden drawer pull. This step is totally optional. The drawer pull I used was unstained wood. I wanted a darker more “viney” look, so I opted to apply a very, very small amount of dark walnut stain to my drawer pull and then immediately wiped it off with a paper towel. Don’t worry about getting it in all the grooves. Set the drawer pull aside to dry. For the white pumpkin, I sprayed the entire pot and tray with my favorite white spray paint that has the built-in primer. I started with the outside of the pot and tray and applied three light layers of spray paint, allowing time for each layer to dry before applying the next layer. Once the outside of the pots were dry, I turned them over and spray painted the inside of the pot and tray/lid. Again, I applied three light coats of spray paint, allowing the layers to dry before applying the next layer. 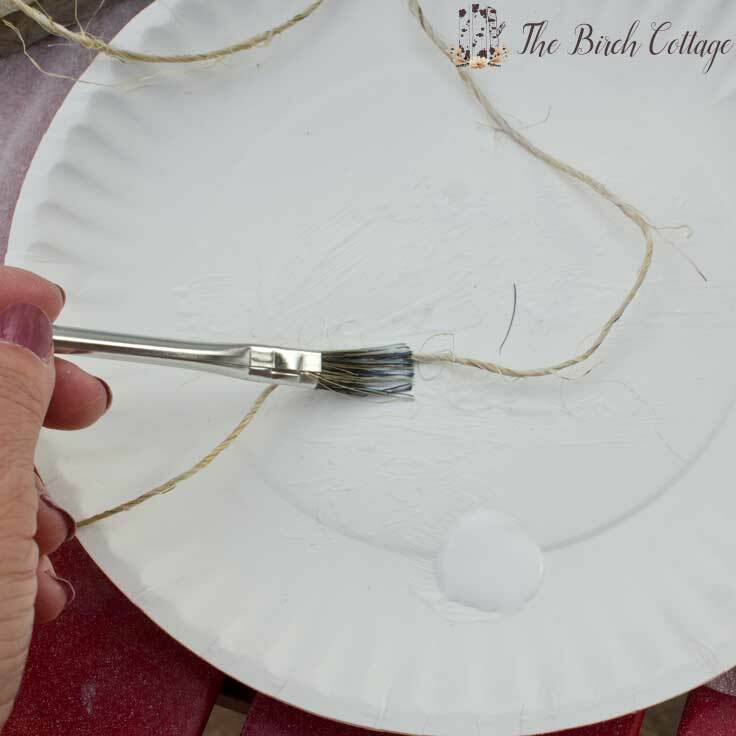 While my painted pot was drying, I took about a 12” piece of twine and using my small paint brush, brushed Mod Podge along the length of the twine. 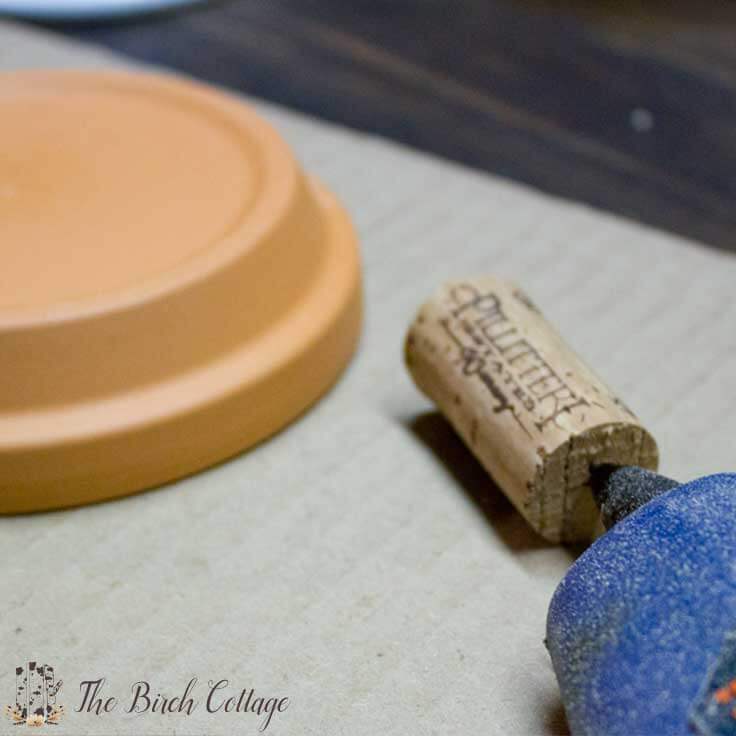 Once your stem and vine are dry, simply apply hot glue to the bottom of your drawer pull or cork and affix to the bottom center of the terra cotta pot tray. Once the stem was dry, I simply wrapped the twine around the base of the drawer pull. You could also hot glue the vine in place around the bottom of the drawer pull or cork. The spray painted white candy dishes took quite a bit of time because it was pretty hot and humid here in Ohio when I spray painted my pots. Not the best climate for spray painting. But, you also have to wait for each layer to dry. I painted three layers on my clay pots. 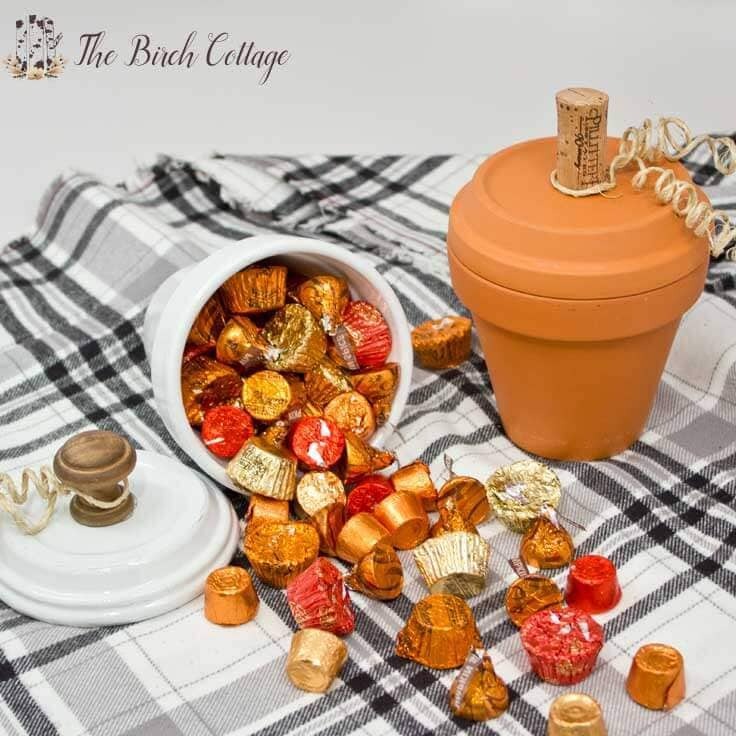 So, just be sure to keep that aspect in mind if you plan to make your own DIY Terra Cotta Pot White Pumpkin Candy Dish from terra cotta pots. It does take time for the layers to dry and you really do want to use light layers. If you apply the paint too heavily, you’ll have lots of paint streaks and pooling. Not all terra cotta pots are created equally. What do I mean by that? 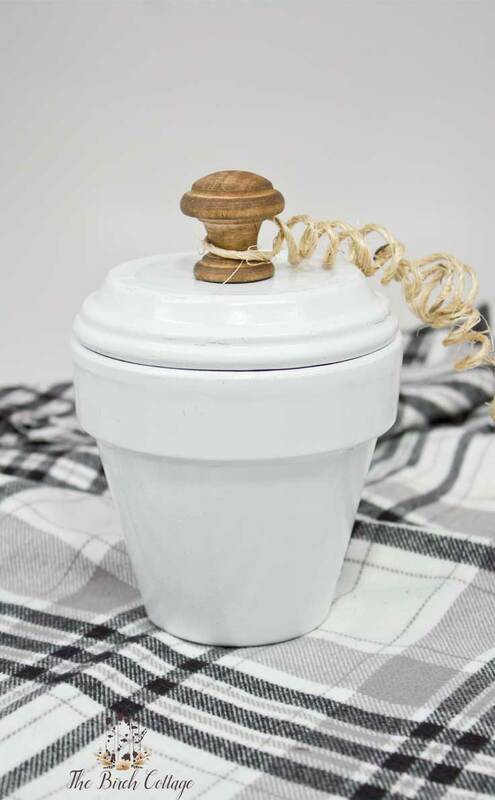 Well, if you’re looking for pots with a nice smooth finish, you’ll probably want to purchase your pots from your favorite craft supply store. If lots of character is what you’re looking for, then feel free to purchase your terra cotta pots from your local home improvement store. I was really surprised to discover that the pots I purchased from a craft store were so much smoother and “nicer” than the pots I purchased from my local home improvement store. The latter had little nicks and imperfections in the clay. Just keep that in mind when you go to purchase your clay pots. So, there you have two versions: super duper easy and super easy. 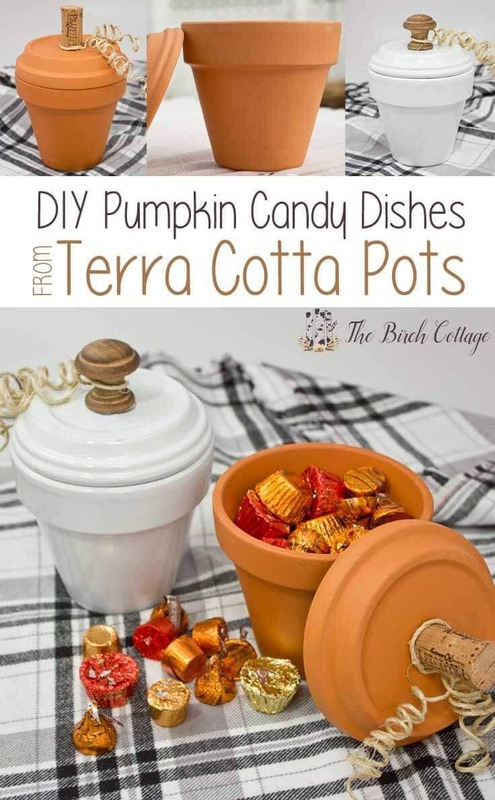 Which of these DIY Terra Cotta Pot Pumpkin Candy Dishes will you make? If you make this project, please come back and share pictures. I’d love to see where your creativity takes you. Are you a fan of pumpkins, but don’t want to carve them? If so, check out this festive fall no carve pumpkin option for Thanksgiving. Cute idea Pam! I love to use terracotta pots to decorate too – perfect for the autumn. 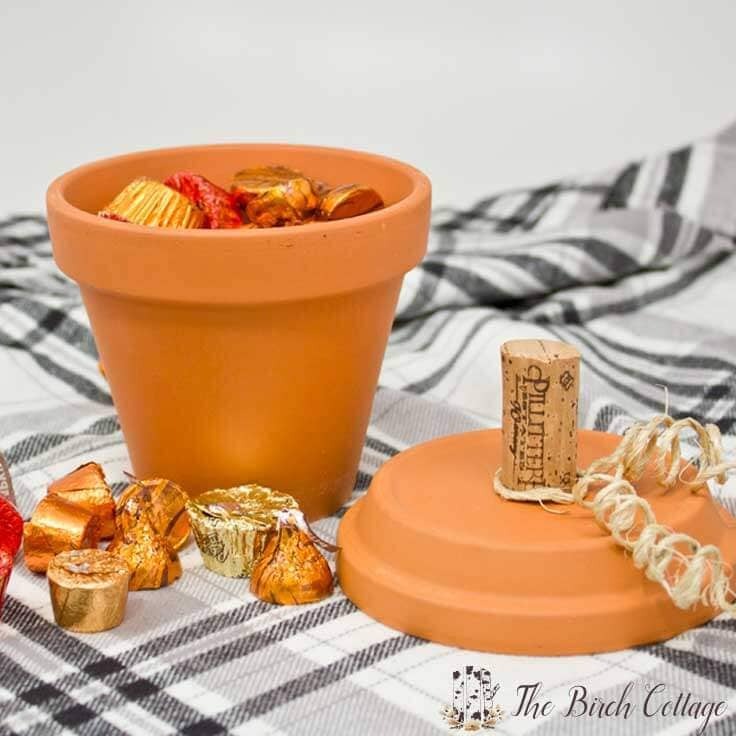 Pam are terracotta pots safe to store unwrapped candy in? I thought they needed to be glazed pots for food. Very interested in this project, just need to make sure about the storage issue. Everything I’ve read says that terra cotta pots are perfectly safe for food. They (whoever “they” are) used to say that there was lead in terra cotta pots. 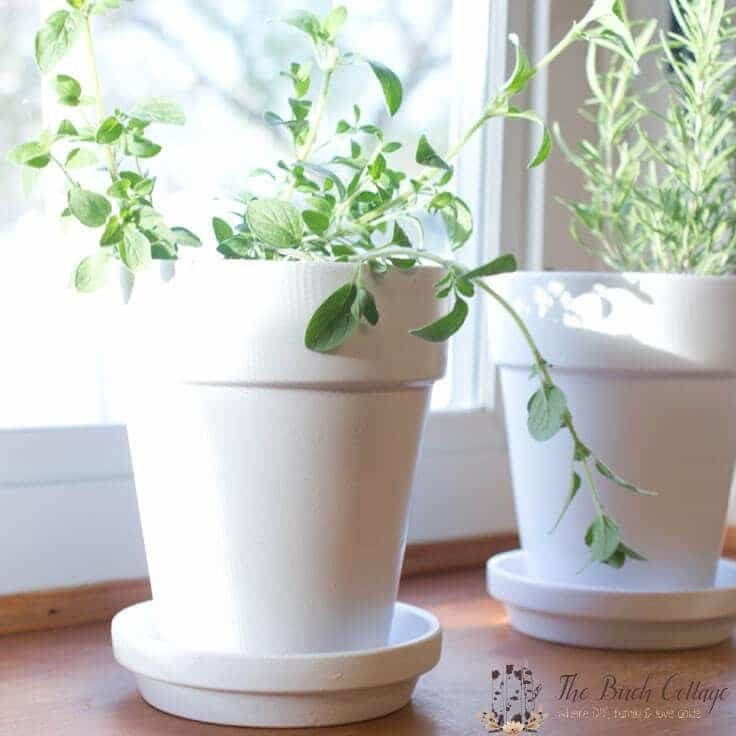 However, these pots are made from earthen clay and manufacturers do not add lead to the clay. On the other hand, you definitely don’t want to use glazed clay pots as the glaze itself may contain lead. Did you know you can even bake with terra cotta pots? (The unglazed ones, of course!) You simply season them like you would a cast iron skillet. The seasoning helps make the clay non-stick and to keep it from absorbing foods. I would wash and completely dry the pots before putting any unwrapped candy in the dish, just to remove any extra dust. I feel like I should include some kind of disclosure, like “I’m not a terra cotta pot manufacturer. Not all clay pots are made to the highest standards. Please do your due diligence before proceeding with this project.” 🙂 Having said that, I think they’re perfectly safe for storing wrapped or unwrapped candy.